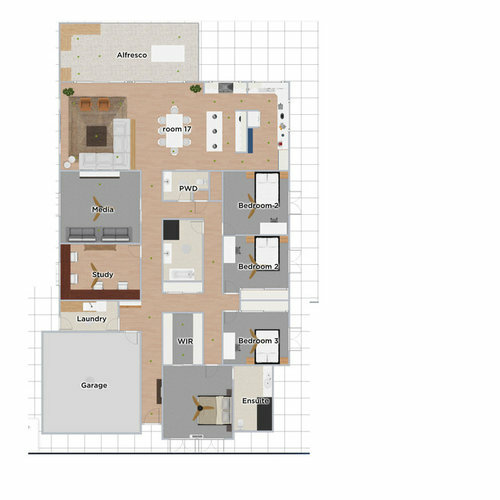 What do you think of this floor plan for our new home? 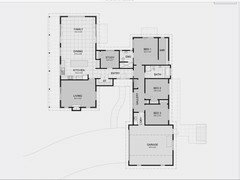 would love your feedback on this plan, this is one of our builder's plan that we changed a little. it's a corner block (corner is on left side) so we must build in lenght due all setbacks etc. front is south facing and rear north facing hence all entertainment areas facing north. we're struggling with Alfresco area, should we go all the way to the kitchen side? That would mean more $$$. We thought about putting alfresco just on the kitchen/dining side and then we can have a window in front of the sink area so these 2 areas can communicate easily, but wouldn't be weird not having alfresco in front of living area, especially if we decide to have glass doors? It might look like 2 islands in the kitchen but it's actually one island and one wall with cupboards and bench top space, we did this to kinda hide pantry area so it wouldn't be too visible, what do you think? We really want a big kitchen, we cook a lot but we don't want all the "backstage" area to be too visible so it wouldn't look messy from the living/dining area that's way the wall in front of island. Do you think there's too much hallway area? Not sure what to do about it, we might go with 110 width on hallway to give an open feeling and hopefully it will help. Study might look big but we both work from home. This is our first home and would love to know what you think So please do share your thoughts and ideas!!! Hi, You want the north sun to come into your windows to heat up the home in winter. Therefore the alfresco you are showing will stop this sun. Is the alfresco under the main roof, or will it be a separate patio system. 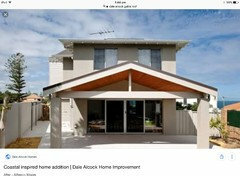 Can you ask builder to quote on a gable patio system. You could extend this across the back of entire home. This will let the winter sun in and would provide cover as well. You could then have a servery from kitchen window out to alfresco. Study and media rooms will get afternoon sun in summer, this needs to be taken into consideration with external shutters,window tinting/uv treated glass or block out curtains. I,m also concerned about ventilation and lighting issues in bathroom and toilet. Maybe install skylights in both. This area with hallways just doesn't seem right. Has your builder another idea with layout? can you add measurements of the rooms and the width and length of the block ... it's difficult to make any suggestion without understanding the spaces better...and there does seem to be too much hallway and with a corner block there could be an opportunity to have a side entry. Good advice from everyone. Particularly dreamer's comment that a northern alfresco will block light from entering your home. Unless you're in FNQ (where heating isn't required in winter), a northern alfresco isn't a great idea, as it shades the home from winter sun. In winter you want sunlight streaming into your home, warming it. If you must have a northern alfresco, add dreamer says, a gable roof (cathedral ceiling) will shade you in summer, while still letting in some winter sunshine. But appropriate length northern eaves are a much better idea. They'll let the winter sun in, but shade the house in summer, when the sun is higher in the sky. As stated, with appropriate eaves, northern sunshine is not a major concern in summer. It's western sun (& eastern sun to a degree) that is the real worry. This is because in this direction the sun is lower in the sky, so eaves become somewhat ineffective. Normally it's advisable to limit western windows. But that's tough to do, as it's a street frontage in your case. The garage on the western side is a good idea, to protect the home from western sun. Maybe the entry too. You've done well to keep the bedrooms on the east, as western bedrooms can be horrible on hot summer evenings. 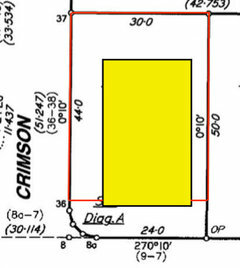 As OKLouise has mentioned, a plan of the block, with all dimensions would be useful (along with setbacks, any easements, other restrictions like maximum for area % etc). Plus any description, like climate, surrounding topography, description of the two roads etc. PS. not very keen on wet rooms without windows. Can get very steamy after a shower. WOW, thank you guys very much. I'll probably sit down with the builder this week and will definitely bring some of your advices with me especially in regards to sun light, we've just moved to Toowoomba, QLD so not sure how hot can it get but I'm guessing a lot as winter is not that cold. Because we played with the Builder's floor plan don't think I have exactly dims, I know we made every room bigger, I'll ask my hubby he has for sure and will share. It's a quite big corner block 1491 m2, 6m setback where faces the road and 2.50m from other blocks, I have a picture. in yellow is the build area already considering setbacks. I guess we have room to play with it. Not too keen of having a bathroom without a window so hopefully the draftsman can work on that. Toowoomba gets very cold in winter, it can get as low as 3 degrees and very windy so it feels a lot colder than the gauge says. Please consider installing a fireplace, our fireplace was lit in May and went until mid September, sometimes longer. In summer it usually sits around 30 - 35 degrees. Unexpectedly to me, due to it's location on the crest of the Great Dividing Range at an elevation of around 700m above sea level, Toowoomba has a climate more similar to Sydney than Brisbane. With average summer highs of only 28°C, & average winter highs of 17°C (lows of 7°C & cold wind, as has been mentioned). It's located in Climate Zone 2: Warm Temperature, the same climate zone as Sydney, not Brisbane. Though this climate zone is very varied, so care must be taken to cater for local conditions. As has been advised a few times, have a good read of the Your Home site. Read this section, Designing for Climate, for zone 5: warm temperate. Along with having cooler temperatures than Brisbane, the fact that Toowoomba is inland means it has greater variation between daytime highs & nighttime lows (diurnal temperature range). This means that unlike Queensland coastal climates, some thermal mass in the home will be appropriate, so a lightweight structure isn't needed. Although a lightweight structure, on a ground-coupled slab (with polished concrete or tiles in North facing living areas) would be a good idea. 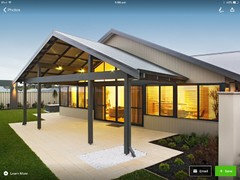 As the temperature is so much cooler than tropical Queensland climates I'd advise against going too overboard with a pavilion style house. As I think it would be too cold in winter. Maybe something like two off-set rectangles, joined in the centre. Kinda like dreamer's inspirational picture, without the middle section, the two rectangular sections joined. Or just go for a more traditional rectangular house. In any case, like just about all Australian climates, you should try to build a house that is generally rectangular, the long sides facing north & south. This will give an opportunity for northern sunshine to enter home in winter, while the shorter eastern & western sides will limit the effect of hot summer western afternoon sunshine. Though I guess this house shape won't look great from the western road, as it will look very narrow from here. You could fatten it's street frontage a little bit, by having the garage to the south of the rectangular house. With such a large block you'll be able to build something that works for you. But as OKLouise said, don't just pick a plan for an average narrow block. The plan you picked is not really suitable for your block. I'd also recommend you do a lot of research yourself. As has been shown with the plan you've received, you can't rely on the builder to design a plan that will work best for you, that is appropriate for your location. So read up on the Your Home website. It's an invaluable resource when it comes to building a comfortable, energy efficient home. Ddarroch, thank you for info re Toowoomba. I thought it would be warmer, being Qld. I continue to learn something everyday, which is wonderful. After readings comments, have noted, and found another inspiration photo which might be more appropriate for climate. Thank you, ddarroch . I've being reading YourHome website and it's amazing how much information I could find, this is really gold!! Thanks. That's funny because we were so certain about this floorplan but now reading all comments not so sure anymore! I really love the kitchen we've put on our plan and would want to have a similar one but I'm totaly open to change everything else. With the setbacks we have 20m width to work with, the reason why we had that plan (which already has 15 width) is because we would add an extra garage instead of a shed, I'm afraid that having a shed on the backyard would block my view but I guess you can't have it all. I am bringing up the weather again. Have you considered under floor heating? a concrete slab I thought I didn't have to worry that much to be honest. I did thought and very keen to upgrade insulation on batts and plasterboards, double glazed windows as well but haven't given much attention to the floor to be honest. One thing I know for sure, won't be putting tiles, too cold ! Our fireplace was in the lounge room as it was an old Queenslander and this position was the best place for it. Where you place it is important but it will heat the whole house if you get it right. It is not something you place in a “room”. 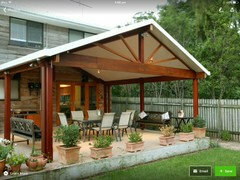 If you decide to have one installed go to a store like BBQ Galore with your plan for advice. On the first plan you could have one installed in the lounge room. Remember to make the heath big enough to store the wood. We had a huge cane basket we stored the wood in. This is all “past tense” as we have moved to the Sunshine Coast. I must admit that I was not a fan of your first floor plan mainly because I could see children making the hallways into a racecourse. Good plan upgrading your insulation Juliana. Definitely upgrade your walls & any raked ceilings (with no roof cavity), as these can't really be done later. Your Home recommends a minimum of R2.8 in the walls. If you are building with a normal (90mm) timber frame, the highest rated batts that will fit in the walls are R2.5 (or R2.7 hd batts). A higher R rating than this requires a larger batt, so would require a large frame, which would increase the cost substantially. So R2.5 in the walls would be adequate. Your Home states a minimum of R4.1 for the roof. If you have a steel roof, reflective (radiant) insulation is important. This is also a very good idea for west facing walls. The launch of our new website ... what do you think? Our Reno floor plan - what else could we do?